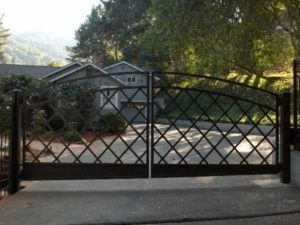 Automatic driveway gates are a good first layer of security. Most thefts are crimes of opportunity. If your home has a security gate and your neighbor’s home does not, which house do you think a thief will target first? If you answered, “Not mine,” then you are very likely correct. Home invasion is another scenario in which having an automated gate increases your security. If the bad guys can’t even get through your gate, they aren’t going to be able to get to your front door. 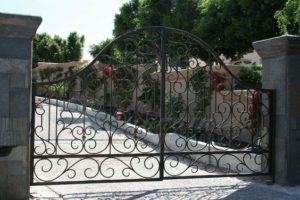 A driveway gate can drastically improve the curb appeal of your property. Your gate can be designed with artistic flair and can be installed so that it really makes a statement and offers a grand entrance to your property. This one’s pretty straight forward: Curb appeal increases your property value and often makes it easier to sell your home. Some insurance carriers wi give you a break on your premiums if you have an automatic security gate installed. This is because insurers know your property is ore secure and that there is less of a chance that you will become a victim of property theft. So check with your insurer because saving money month-over-month and year-over-year is pretty awesome. Help keep your kids safe from traffic or predators. With an automatic security gate, you gain a greater sense of security while your kids are playing in the yard, comfortable in the knowledge that they won’t be chasing any balls out into the street or won’t have to deal with strangers ambling into your yard. Along with perimeter fencing, an automated gate helps keep your pets within the boundaries of your property—something your neighbors are likely to appreciate. In addition, a gate helps keep potentially dangerous animals out of your yard. Prefer not to deal with pushy solicitors? Stop them before they get to your door. If your property has an automatic gate standing guard, that salesman won’t be able to knock oon your door and interrupt your meal. If you’re ready to talk to one of our gate installation professionals here in the Las Vegas area, head to our contact form. American Iron is a family owned and operated business started in 1999 in Las Vegas. We offer both residential and commercial services and pride ourselves on providing high quality wrought iron products at competitive prices. Wrought Iron? Rot Iron? Rod Iron? What is it?